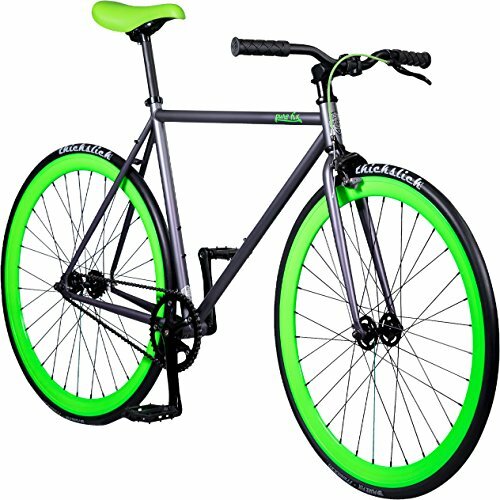 Get in a position to take night riding to a complete new level at the pure Fix glow at nighttime fixed-gear 1-speed bike from Pure Cycles. The bike’s paint is solar-activated; just give the bike an hour of daytime sun for an hour or more of night-time fun. Pure Fix bikes get started with the simplicity and elegance of an urban geometry frame and straight fork made out of durable high tensile steel to provide the ride and the attached feel you wish to have out of your fixie. The flip-flop hub lets in you to select to ride the bike as a fixie or simply cruise and coast at the freewheel side. The steel frame features dual water bottle bosses and rack and fender mounts. A 1-1/8 inch threadless headset holds riser handlebars with branded grips on a threadless stem with a 25.4mm clamp. Classic and comfortable drome saddle gets the job done and assists in keeping the burden down. Front caliper brake stops when asked, easily put off for a purist ride. Nylon platform pedals connect to a few-piece sealed bearing 44T crank set. GEAR ratio is 44:16 with 74.25 gear-inch the usage of a KMC chain. Custom WTB thick slick 700c x 28c tires feature twice the safety of a typical rubber Casing; 60mm Presta valves provide pressure retention. All of this joy not more than 20 to 26 pounds, depending on size. Celebrating bicycling for all that it offers, Pure Cycles offers plenty of frame, geometry, and gearing options in addition to compatible accessories, including a range of handlebars, saddles, water bottle cages, foot straps, and more.